Halloween elite team THE JACKIE FACTORY (Jackie 60, Night of 1000 Stevies) reunite with co-producer EDITRIX ABBY (Click + Drag, Burning Man) for the fifth annual GHOSTLIGHT, a Halloween theatrical and costume party benefiting the HOWL EMERGENCY LIFE PROJECT (HOWL HELP), the East Village wing of THE ACTORS FUND. 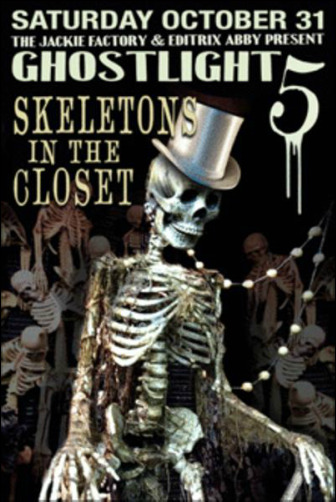 The theme of this year's GHOSTLIGHT is "Skeletons in the Closet" - feel free to interpret it with whatever might be buried in yours or your best skeleton finery. Set in the venerable and haunted GENE FRANKEL THEATRE on Bond Street, the evening's theatre-as-nightclub will again host Downtown performance icons and rising stars from many dynasties. The 2015 bill includes world burlesque supernova DIRTY MARTINI, Gothic Princess POISON EVE (BLACKLIPS), crooner XAVIER (SLOW KNIGHTS), thesbian goddess HEATHER LITTEER, nouveau drag artiste SEVERELY MAME (BATH SALTS) and the costume genius of ART BY DAVEY. Ghostlight's "Secret Cinema" will feature a full screening of East Village/ BLACKLIPS Horror classic JACK THE RIPPER by FLLOYD at 9:30 PM plus silent programming (still in production) after midnight. On a night that can be TRULY scary outside, it is a glam sanctuary here: A marvelously mixed and dressed audience, reasonably priced drinks, AND a great cause! GHOSTLIGHT producers CHI CHI VALENTI and EDITRIX ABBY join the golden-throated MC PAUL ALEXANDER as the Mistress/Masters of Ceremonies and the divine DJs are JOHNNY DYNELL, SAMMY JO and ALTHEA LOVELESS. Performances are in two sets at 10:30 and and 12:30 - please consult mothernyc.com/ghostlight for complete schedule as we get closer. SUGGESTED DRESS: Skeleton Gone Clubbing, Haunted Theatrical Glamour (all eras), Black Tie with Skull Mask or other Creative Costuming.